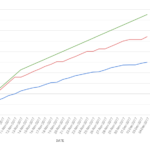 This is the second update of a series of posts dedicated to tracking and analysing the Android version distribution over time. The time frame considered in this update covers the last 2 years of Android: December 2012 to December 2014. If you are interested in older data you can also check the previous update and the first post of the series which cover the Android version distribution since June 2012. As you may have noticed, numbers in red are used when a version of Android has lost distribution share (respect the previous month), whereas green numbers represent a growing distribution share. Version 2.2 (Froyo) kept losing market share, eve if slower than I expected. It will probably disappear soon though. 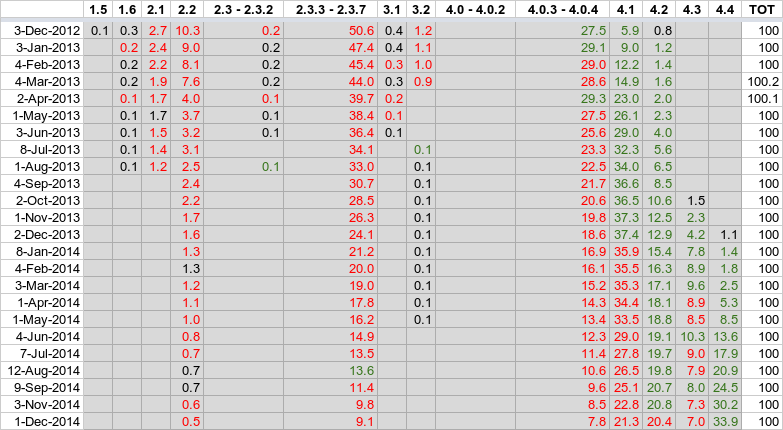 Version 2.3.3 – 2.3.7 (Gingerbread) keeps losing share, but, according to my projection (based on 2.2), it won’t completely disappear before early 2016. Version 4.1 (Jelly Bean) is not leading the Android market any more since last September and it constantly declining, it’s still the second most used version though. 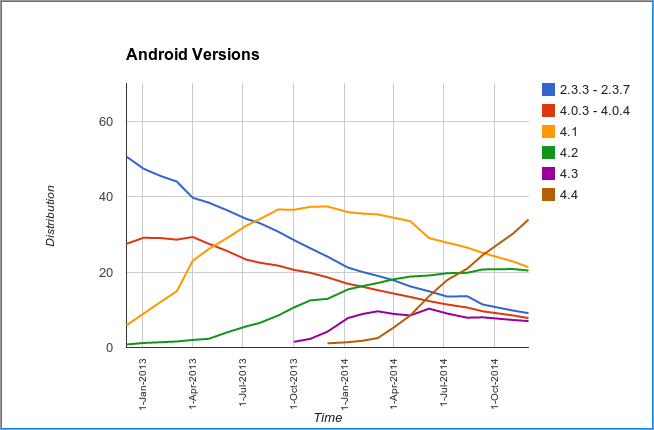 Version 4.2 (Jelly Bean) was gaining market until last month, but now has started its decline. Version 4.3 (Jelly Bean) is still alternating drops and raises, but the trend is probably going to stay negative in the next few months. Version 4.4 (Kit Kat) is the rockstar of the last 6 months with a 250% growth since last June. Furthermore it’s the only version which is still gaining market up to December. To have a better visual understanding of the data I’ve also created a graph of the evolution of the 6 main versions over time, these are the distributions with more than 1% of market share which overall cover 99.5% of the Android market. 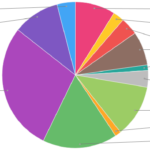 Overall Jelly Bean is still the most used Android version with a 48.7% of market share, but the raise of KitKat in the last months has been very strong and with the recent release of Android 5.0 Lollipop things probably will be completely different when I’m going to post the next update in 6 months. I may also decide to publish the next update in 3 months if something interesting happens or if enough people are interested, so if you are, leave a comment and let me know.